It’s the week-end everybody! And I can’t believe I’m saying this already, but we woke this morning to just a light dusting of snow on the deck. Even though I find the first few snowfalls kind of exciting, I do feel that we seemed to have skipped fall entirely. I’m hopeful that this was just a blip on Mother Natures part, and this week we will be back to crisp, windy, sunny fall days. Yesterday I was sorting through my old bakery recipe book, looking for some inspiration, when I came across this recipe. For those of you who might be new followers, I used to own a little bake shop and let that go so I could focus on my real love. Which is you. And blogging. And creating. And I’m so glad I did, because it’s given me so many new opportunities that I wouldn’t have had otherwise. And not waking up at 3 am on Saturday mornings anymore is a major bonus. I can tell you, your local baker is seriously sleep deprived friends. These Mini Brownie Bottom Cherry Cheesecakes were one of my most popular items in the fall and winter. Still, when I run into some of my loyal customers, they bring up these cheesecakes and tell me how they miss them so. They are a decadent treat that can easily be customized. The brownie bottom is just the right amount of rich chocolate, paired with the creamy cheesecake topping and of course, the cherries on top. This is also an amazing treat when you swap out the cherries for whole pecans and a good drizzle of homemade caramel sauce. As you know, I love a dessert that can be made ahead and these are no exception. Cheesecakes freeze very well, so can be prepared a week or two ahead of time if needed. Just thaw, garnish with toppings and serve. Reminiscing through my old book sure did make my heart skip a beat. It was such a busy and exciting time in my life. Even though I do miss the bake shop sometimes, I’m so happy that I get to share these recipes with you. I’m exactly where I was meant to be. For the brownie layer, mix the flour and salt in a small bowl and set aside. Place a small glass or stainless bowl over a pot of simmering water and melt the chocolate and butter.In a medium mixing bowl, combine the sugar, eggs and vanilla and whisk until well incorporated. Whisk in the chocolate mixture and mix well. Fold in the flour mixture with a spatula, just until incorporated. Spoon the brownie mixture into the bottom of each cupcake liner. Bake for 10 minutes and set aside. Once baked, reduce the oven temperature to 300°. While the brownie layer is baking, prepare the cheesecake layer. Beat the cream cheese and sugar in a medium bowl for at least 4 minutes, or until smooth and well combined.Add salt and vanilla. Add the eggs, one at a time, only mixing until the eggs are combined. Be careful not to over mix and add too much air. Top each brownie layer with the cream cheese mixture. Bake for 20 minutes. Turn the oven off, prop the oven door open just slightly with a wooden spoon and leave the cheesecakes inside until the oven cools. (I just found the texture was a little nicer this way and the cheesecakes were less prone to cracking). Put room temperature cheesecakes in the fridge or just in the cake pop makers to chill for 3-4 hours before topping and serving. 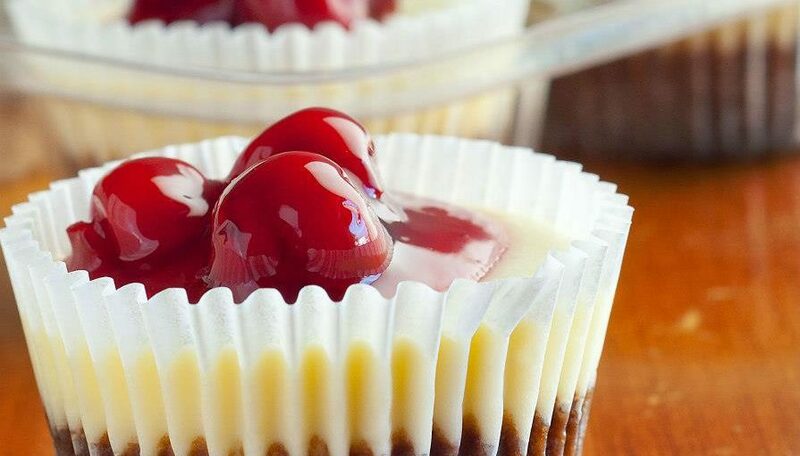 Top chilled cheesecakes with cherry pie filling and serve. You can bake the cheesecakes without leaving them in the oven to cool. Bake at 325° for approx. 25 minutes. Cool to room temperature and chill. Once the cheesecakes have come to room temperature, they can be easily frozen for later use. Place them in containers, in a single layer and wrap with plastic wrap. Defrost and garnish with cherries just before serving.